Officials say the chances of completely freeing the whale are slim because of its size and the nature of the entanglement. LONG BEACH, Calif. — Rescuers will try again to remove more than 100 feet of fishing line from an entangled humpback whale that’s been moving south along the Southern California coast. A team with the National Oceanic and Atmospheric Administration cut away up to 100 feet of rope and buoys Friday but the 35-foot-long whale became agitated and dove deep, eluding rescuers for the rest of the day. It was spotted again Saturday off the San Diego County coast, said Justin Viezbicke, a NOAA program specialist who was part of Friday’s effort. The whale is the same creature that was seen struggling with ropes several days ago off Santa Barbara, he said. Viezbicke cautioned that despite the attention the rescue was receiving, the chances of completely freeing the massive animal were slim because of its size and the nature of the entanglement. The line is coming out both sides of its mouth, then passes under the animal’s pectoral flippers and trails to the back of the whale, where it’s stretched over and under the tail fluke, he said. A large knot of fishing line is trailing about 10 to 15 feet behind the whale and a single line strings out behind, he said. The line is also preventing the whale from using its tail as it should and it’s compensating by using its flippers to propel itself – something that could tire it more easily, he said. 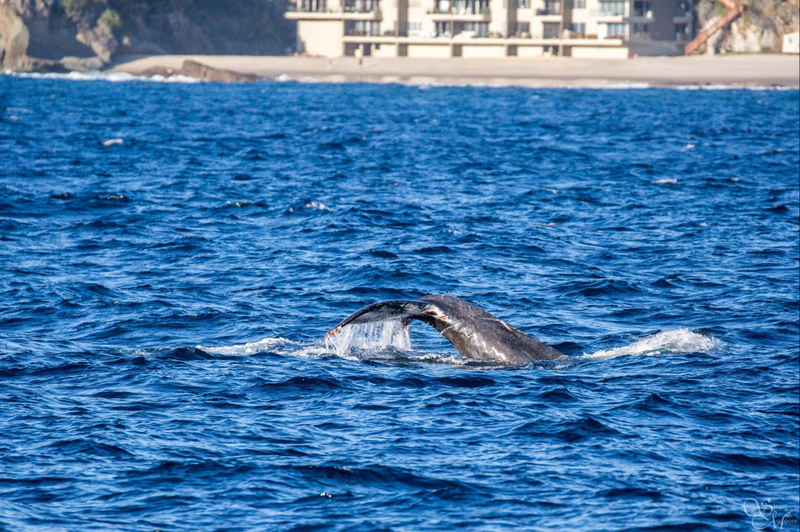 The whale was reported to authorities Friday by a whale watching vessel off Balboa Island along the Orange County coast. Slater Moore, who works for Davey’s Locker Sportfishing & Whale Watching, was shooting video using a drone while on a whale watching tour Friday and noticed the entangled creature on his footage. His boat stayed with the whale until authorities arrived. NOAA’s whale rescue team has responded to about 50 entangled whales since January – a spike that could be attributed to warmer waters bringing the giant animals closer to shore, where they encounter fishing gear, Viezbicke said. In this case, the rescue team cut away some buoys that contained identifying information that will allow scientists to figure out where the whale became entangled. “Our response network is really just a Band-Aid,” Viezbicke said. “We’re looking for ways to be proactive and minimize these situations in the future,” he said.